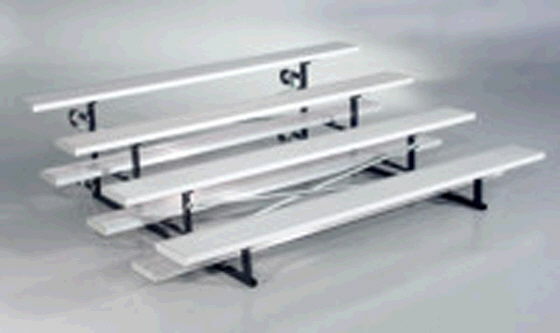 Bleachers have 4 rows of seats - includes 7 aluminum planks and 2 frames. Set up bleachers are 15' L, 80" D (6'8"), 1st row =16", 4th row = 36"
On the bottom row your feet are on the ground. * Please call us for any questions on our bleacher 15 foot 4 row aluminum rentals in Ft. Wayne IN, Warsaw, Syracuse, Auburn, South Bend, Indianapolis IN.